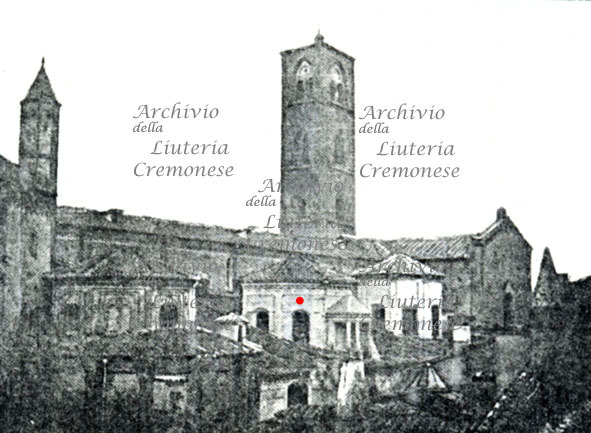 In the “Rubrica Y a) Liutai (Section Y a) Luthiers)” that is the inventory, made between 1903 and 1914 – of luthiery relics of the Civic Museum of Cremona, when it was in the Ala Ponzone Palace in Corso Vittorio Emanuele (Gregori 2014), n.29 of the list is registered as the “viera of marble well from the house formerly inhabited by luthier Antonio Stradivari", given by Mr. and Mrs. Soresini Piazza, who owned, at that time, the building in Piazza Roma (since 1870), situated in Piazzuolo S. Domenico, in front of the facade of the convent church. The Stradivari family had lived in that atelier since 1680 to 1744 (fig. 1). Since 1746, it had been rented out to the Bergonzis, who lived and worked there until 1758. It had been rented out to many other people, until in 1777 don Giuseppe Stradivari, Antonio's son and executor of his brother Paolo, together with his nephew Antonio, sold the house to a certain Giovanni Ancina. The Soresini Piazza's house had been demolished, with all the quarter (where were situated also the houses of the Guarneri, the Amati, Storioni and the Ceruti), to build the “Palazzo delle Assicurazioni” unveild in 1933, at the time called “Palazzo XXIII Marzo” and nowadays known as “Galleria XXV Aprile”. 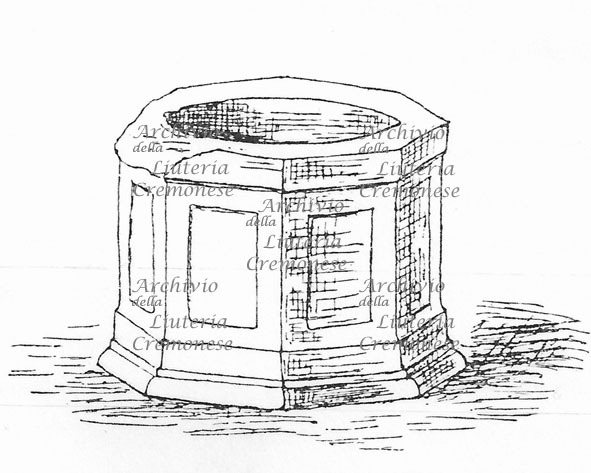 The well curb, pictured in a drawing by prof. Tancredi Venturini (fig. 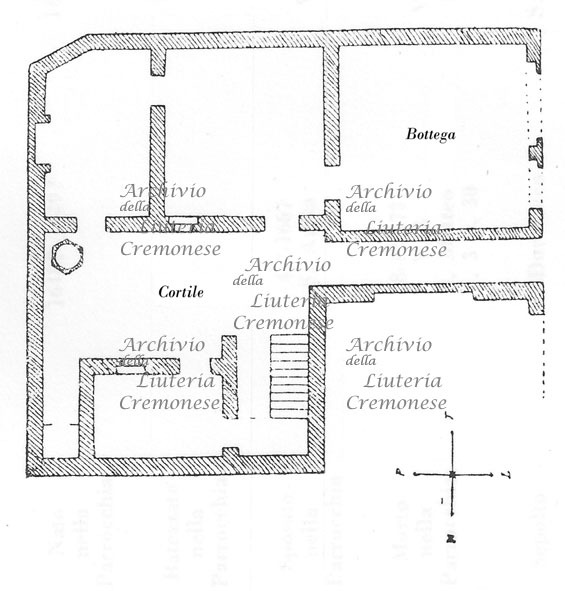 2), published in the book by Alfonso Mandelli (Mandelli 1903), was originally situated on the North-west corner of the courtyard, as specified on the map of the house (fig. 3). The images published by Mandelli had been reproduced also in the monograph about Stradivari by the Hills (Hill 1905), in two articles of 1929 (Bonetti-Cavalcabò-Gualazzini 1929 Bonetti 1929) and in a book published in 1937 (Bonetti-Cavalcabò-Gualazzini 1937). Two pictures by photographer Ernesto Fazioli (1900-1955), probably taken in the Thirties, preserved in the “Fazioli” collection property of Regione Lombardia, represent the ring nut of the well: in the first picture (fig. 4 - http://www.lombardiabeniculturali.it/fotografie/schede/IMM-LOM60-0033820/) it is alone; in the second one (fig. 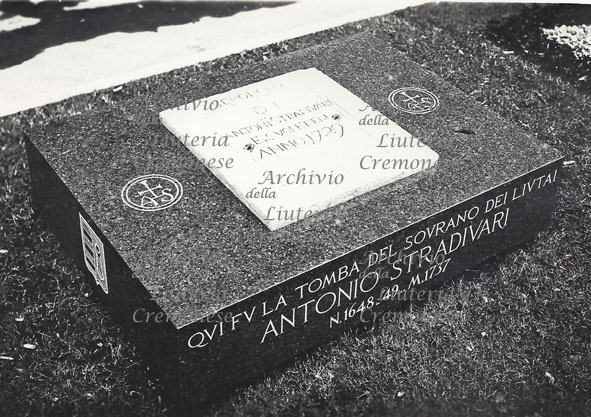 5 - http://www.lombardiabeniculturali.it/fotografie/schede/IMM-LOM60-0033818/), it is represented with the tombstone of the Stadivari family, as it was exhibited in the new location of the museum openend in 1927 in Affaitati Palace and the next former Hospital of Fatebenefratelli and was publiched by Renzo Bacchetta (Bacchetta 1937 and 1948 (II)). The tombstone, previously situated on the floor of the Rosary Chapel in the church of San Domenico (fig. 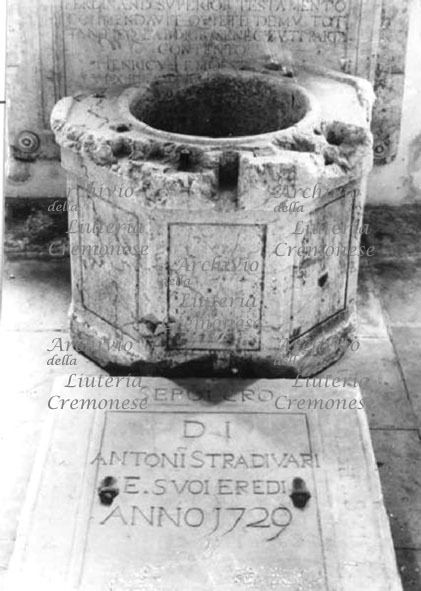 6), had been given to the Municipal Museum of Cremona when the church was demolished ( Rubrica Y a) Liutai: Stradivari / n.4) and since 1953 had been trasferred on the commemorative monument of the tomb of Stradivari placed in the park in Piazza Roma (fig. 7), designed by the sculptor Dante Ruffini. Recently, the tombstone had been replaced with a bronze copy and the original one had been taken back in the Museum. Apparently, these two pictures by Fazioli are the only evidence of the big relic, that I'd been unsuccessfully looking for during my several “recognitions” in the warehouse of the museum between 1982 and 1986. 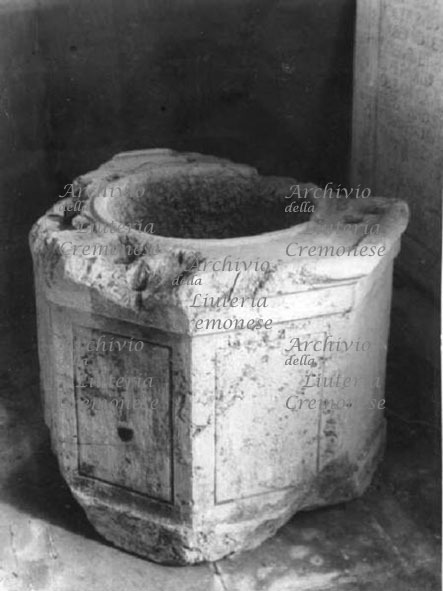 The ring nut hasn't been found yet, not even in 2009 when the archaeological relics have been moved to the new Archaelogical Museum, located in the church of San Lorenzo. 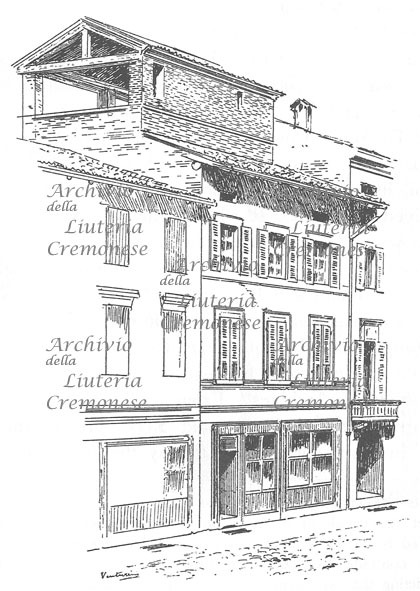 In 1948, Renzo Bacchetta published the pictures of the facade of the house and of the tombstone, but not of the well, in one of his essays (Bacchetta 1948). Probably, at the time the ring nut wasn't in the museum anymore, but there is no clue about where the relic can be now. a cura di Cecilia Gregori.